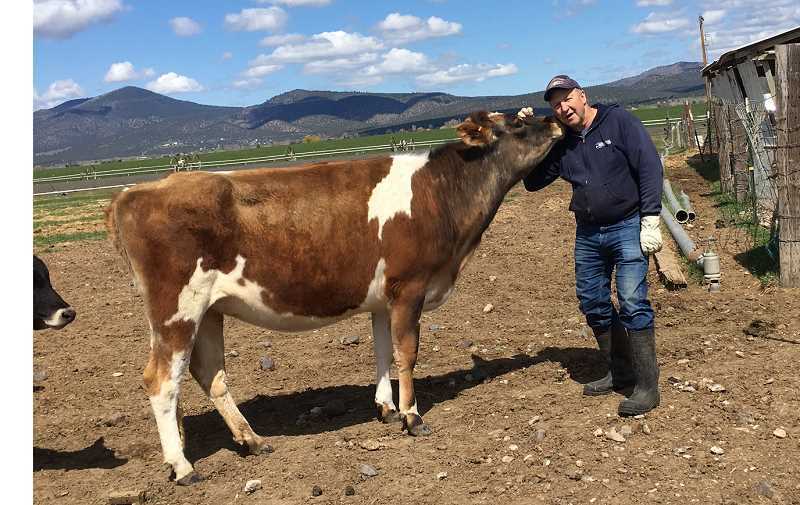 PHOTO COURTESY OF BILLIE JOHNSON – Keith Eager, a Windy Acres Dairy Farm volunteer, gets a kiss from Valentine, a 2-year-old heifer. All of the farm animals seem to love Eager, and they always run to visit him. The farm hosts Family Dairy Day on Sunday, June 18. Got raw milk? How about butter, cream, yogurt and cheese? You can get it all at Windy Acres Dairy Farm, a small herdshare dairy in Prineville. Billie Johnson, the dairy’s owner and operator, welcomes families to check out her offerings and enjoy lunch during Family Dairy Day, set for 10 a.m. to 4 p.m. Sunday, June 18 at the farm on Stahancyk Lane. “We want people to come — anybody that is interested in food,” Johnson says of the annual event, adding that it serves as a family appreciation event and annual meeting for her herdshare members as well as a chance to educate the public about dairy products. “It’s a gathering of those forces because people come and they share their information with one another,” Johnson explained. Dairy Day is open to herdshare members, those interested in becoming members, and to the health-conscious public wanting to source food from this diverse, pasture-based, raw dairy herdshare farm. It features vendors, live music, a petting zoo and food. Members will provide demonstrations and classes on such topics as ghee making (ghee is a class of clarified butter), sourdough bread making, herbs, raised bed soil preparation, greenhouses and fermentation. Johnson will provide the meat, but visitors are encouraged to bring a side dish to serve 20 people. They are planning for 100 guests. “If we end up having more and have to feed more, then I guess we’ll bring out more burger and get it going,” Johnson said. Windy Acres Dairy Farm formed in the fall of 2003 with 44 milk cows. These days, she milks 30-some cows — they are Brown Swiss, Jersey, Holstein and Guernsey crosses. “I call them a Windy Acres breed,” Johnson laughs. They make all kinds of dairy products — not just unpasteurized milk. Her list includes butter, cream, yogurt, sour cream, cheeses and colostrum. They raise turkeys, chickens, pigs, lamb and calves and offer eggs, pork and beef. Blueberries and honey are available seasonally. Johnson gets lots of help from volunteers and herdshare members. In a herdshare, the shareholder purchases a share of a dairy farmer’s herd and receives a portion of the product of the herd proportionate to the shareholder’s corresponding interest. Windy Acres began herdshare about 12 years ago and now has roughly 100 families as members. She delivers the goods to herdshare members all over Central Oregon as well as to Portland and the Ashland and Medford area. In order to prepare the dairy for the Family Dairy Day visitors, Johnson worked with Central Oregon Locavore, a Bend-based nonprofit that supports local food and farms through educational programs and a year-round indoor farmers market. Locavore offers Willing Workers On Local Farms (WWOLF), a community program that provides organized volunteer assistance in the form of volunteers, or “WWOLF packs,” to local farmers at their farms or ranches. In return, volunteers learn where and how local food is grown while fostering an intimate connection with food. Roughly 15 volunteers pitched in at Windy Acres this week, cleaning, clearing, mending and preparing for the June 18 event. Johnson says she is excited to have help from WWOLF volunteers.